La Fontaine’s public love affair with Ibn-Battuta‘s travel, Sufi mysticism, and ancient lands continues. May 29 under the stars explores modern Turkey and India with an eye to the past. Still can’t find La Fontaine? Here’s a link to a map. “Next door” or “Near to” are typically included in the directions a Bahraini gives but they are not literal. My experience is Bahrainis are so knowledgeable about the honeycombed streets, they find it difficult to give detailed directions an outsider needs. If I wanted to ever find my way back, I would have take a daytime, reconnaissance trip. Arriving before 7pm, we met some old school friends on the doorstep. Hearing I was from California, one women became particularly interested. “Where – in Los Angeles?” she asked. “So did my husband,” I told her and instantly we became friends. My new friend insisted on showing us the recently opened Mohammed Bin Faris House Museum where the legendary Bahraini artist used to live. Born in 1855, he recorded several Al Sout albums in Iraq and two albums in Bahrain before his death about 1946. Looking around his one-room house, his albums did not go platinum during his lifetime. Still seventy years later, his music continues to be played live. At 7pm, ten Bahrainis wearing matching winter-grey thobes entered from the stage left and began setting out their instruments – a qanum, violin, oud, several drums and an electric keyboard. “Who do you think will dance?” my friend asked me. Without any introduction, the singer began. A slow song, “About love,” my friend whispered to me. By the second song, the tempo sped up, the clapping began and then the dancing. It was not the young Perrineau look-a-like; rather, the oldest man, a tall man of African descent with a missing front tooth began a slow, somber walk across the stage. Soon the music inspired him. He spun around, placed his hand on his ghuttra and jumped high off the ground then spun again. The twinkle in his eye showed us how much fun he had before returning to his seat to help out with the percussion. When the spirit moved him, he would get up. As the songs continued, love song after love song, his shoulders started shimmering and his gestures grew more flirty. He paused to pose for us, the photo-taking audience, or to smile at a friend. “His jumping reminds me of the African dancers we saw in Tanzania. Is he Bahraini?” I wondered. I read later, liwa is a traditional African dance performed in the Gulf by people from Tanzania and Zanzibar. Usually the al-sout was a male-only dance performed at night. We did not have another appointment so continued to listen to song after song about love – “if you love me, how could you have done this to do me” and “I see your face in the water I drink”. Finally, the topic moved from loving women to loving Bahrain. 7pm every Thursday night, the band will perform in the Mohammed Bin Faris hall. Courtesy of the Ministry of Culture, their concerts are free. There is little parking around the hall. It might be easier to take a taxi. The Hall opened in April 2013 and is part of the Muharraq revitalization project. Across the street, a new Zaffron café has opened. It is built over an old date juice building. The acrylic floors make you feel like your floating. Zaffron serves breakfast, coffee and tea. “During my college vacations, I returned home to Ramallah. We sat together at her dining room table, stringing pearls and talking about my life in the US,” said Lina, Juman Pearls’ designer, to the gathered women. We were at the Anamil 296 Gallery to hear women artists describe where they found their inspiration. Pearl by pearl, Lina sorted through her bag to design pieces inspired by the particular pearl’s luster. Working with eastern-province goldsmiths, she created jewelry she imagined elegant women, like her mother, Wedad, would wear. With each sale, her confidence grew. Together the mother and daughter traveled to Hong Kong to bargain for cultured-pearls, diamonds and other gems. Wedad loved stringing pearls, while Lina loved designing. Their “pearling business” grew and before they knew it, they needed an official name. They named their company Juman Pearls, after Lina’s only daughter. 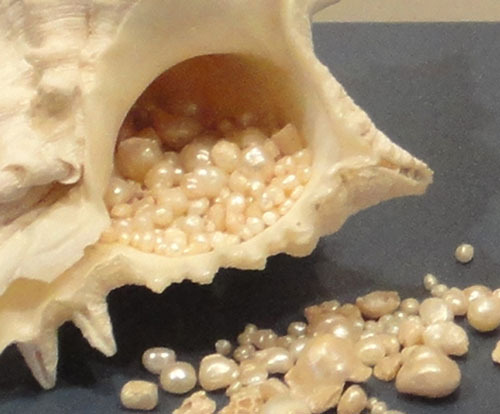 Since antiquity, legends say within each pearl was life – everlasting life. Gilgamesh, British royalty and Jacque Cartier found their way to Bahrain, the land of two seas where the tiny, high-quality, juman, pearls were found. “The pearls round Arabia on the Persian Gulf…are specially praised,” wrote the Roman, Pliny the Elder. By the 1930s, pearl buyers flocked to Japan for Mikimoto’s less expensive, cultured pearls, and the Bahrain pearl divers lost their livelihood. Today 95% of cultured pearls come from China. Rumor has it, the Japanese have returned to the island in search of Bahrain’s now-elusive, natural pearls. Like other pearl merchants, Lina eventually made her way to Bahrain. And as life happens on the island, one day, while she drafted designs, she discovered she sat side-by-side with Bahrain’s preeminent, pearl trader, Mahmood Pearls. Lina was thrilled to be invited to build a collection around such legends. No wonder the pearl trader only gave his wife one. “On a gold chain around her neck, she wore a round white pearl, a gift from his father; it shone like the moon in the night sky.” from The Little Pearl Merchant. Mahmood Pearls will be debuting Lina’s designs at Jewelry Arabia. Perhaps you will find your own moon, wrapped in gold, to hang from your neck. Since the 1990s, Juman Pearls has found favor with Saudi Arabia’s high-end buyers who seek unique pieces that are not mass-marketed. Lina also designs for expatriates who are tired of the traditional, 22K gold bangles and want more up-scale treasures. For the first time, Juman Pearl’s designs will be for sale in Bahrain. In conjunction with Mahmood Pearls, one of the oldest jewelry companies in Bahrain, Lina created the Arabesque collection with Bahraini pearls set in gold. Juman Pearl’s showroom is at Desert Designs in Al Khobar, Saudi Arabia. The entire Arabesque Collection, featuring cultured pearls set in gold, is on display at the showroom. The website is www.jumanpearls.com. The biggest jewelry show in the Middle East starts November 19th at the Bahrain Exhibition Center. Look for Al-Mahmood Pearls. 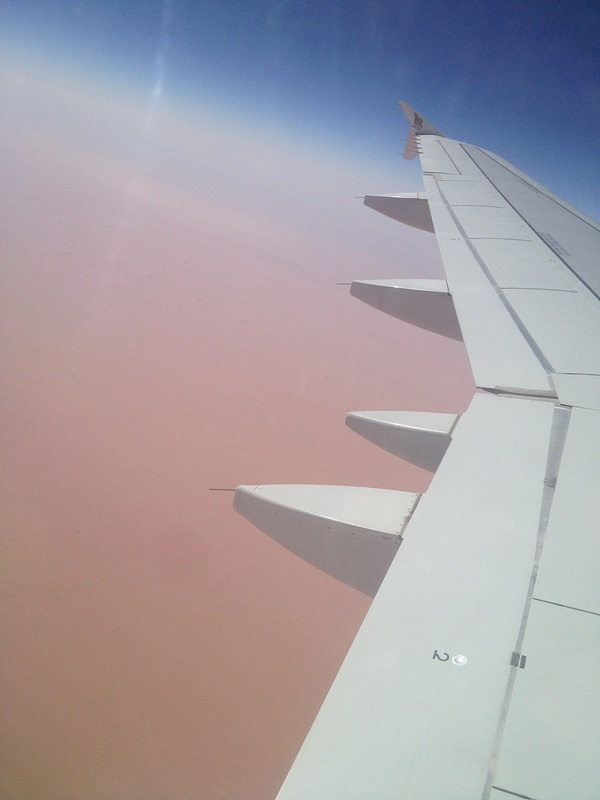 Flying over the Rub al Khali, Louise and I flipped through Gulf Air’s September magazine and talked about the articles. A travel writer, Louise used to be the editor for the magazine. 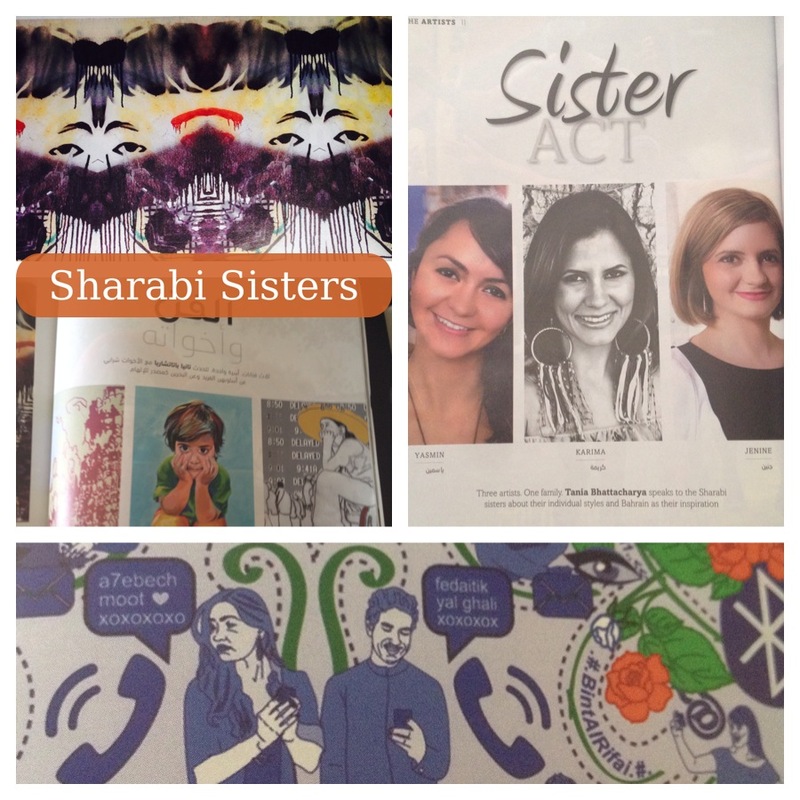 There was an article about the Sharabi sisters. The daughters of an American woman and a Bahraini man, the three women are artists. 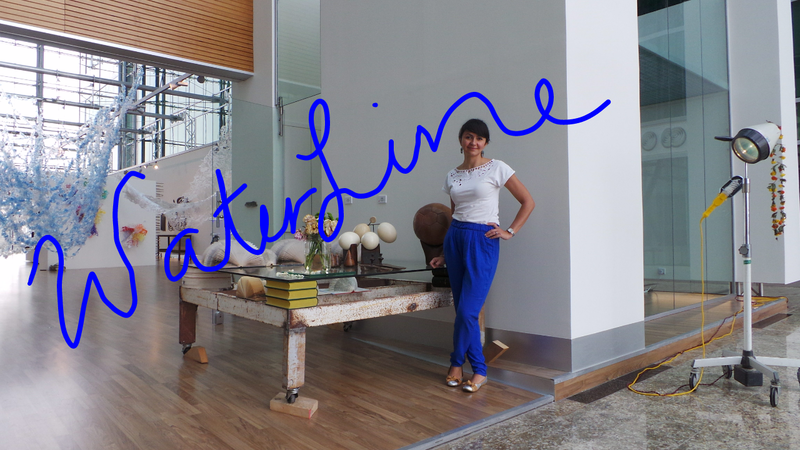 Yasmin is the curator at the Waterline Gallery. She is one of my yoga teachers. Her husband organizes the increasingly popular, FarmFest concerts. Recently I texted him after I saw his smiling face featured on a local billboard. Ah, the small world of Bahrain. Last night, during dinner with my writer-friend, I raised the issue about which medium tells a better story – writing or video. A reader since childhood and now a writer, I cannot imagine life without printed words. My kids’ generation, the Millennial generation, don’t know an Internet-less world. We live in a country where public libraries do not exist and books cost more than most people’s daily salary. YOUTUBE is free and pirated DVDs can be purchased for less than a cup of coffee. Instagrams to family 2,000 miles away are cheaper than a phone call. Twitter is the source for local, breaking news. Visual and graphic communication are the future. Inspiring stories about young women who overcome emotional and financial barriers to creatively express themselves are the topic for the GIVE A GIRL A BREAK contest. Through video, three, young females filmmakers offer their stories both as an artistic expression of themselves as well as highlighting how a small bit of support helps other reach for their dreams. 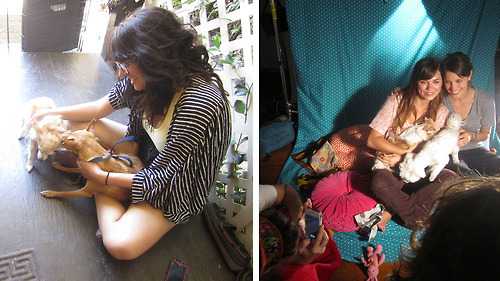 Created in Los Angeles, these girls had access to lights, cameras, computers, actors and great locations to create their short-films. On the other side of the planet, a smaller exhibit highlighting women and communication took place. 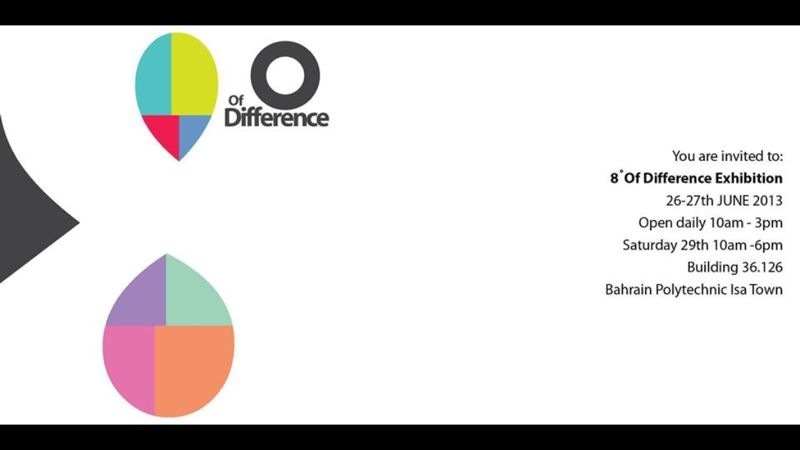 Graphic communication was the focus of the EIGHT DEGREES OF DIFFERENCE exhibit in Bahrain. 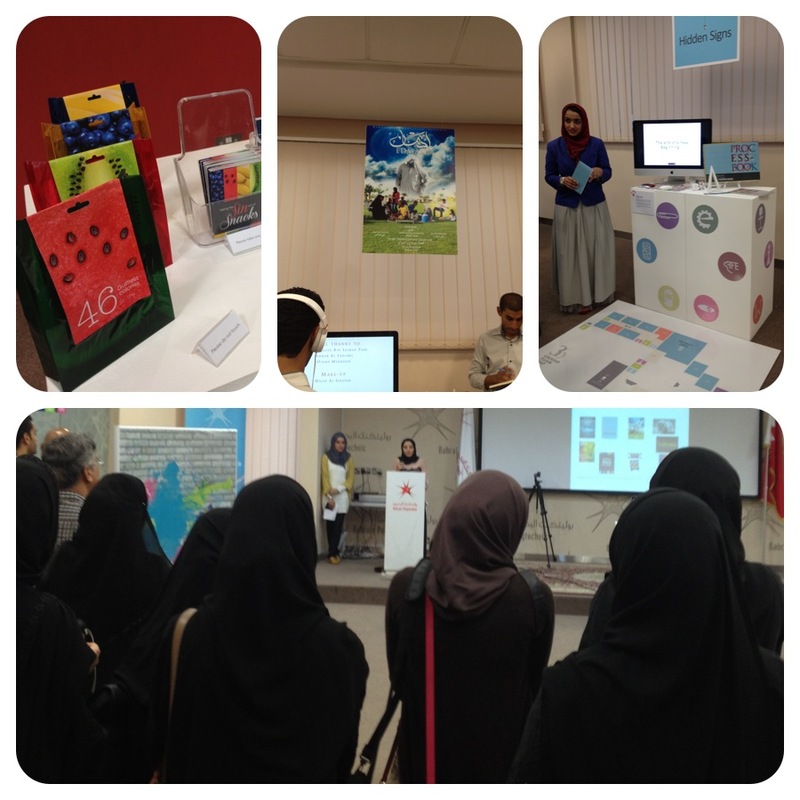 Eight, Bahraini women presented their graphic design, video and digital photography projects. They focused on life-affirming topics such as gratitude, family communications, healthy eating, and imagination and on clear communications through maps, typography, signage and even graffiti. Milling with the audience composed of Bahrainis, Pakistanis, Africans, and Europeans, it became obvious to me that the women’s messages transcended culture. Whether one spoke English or Arabic, the visual exhibits spoke a language everyone could understand. My best friend Jenny is featured as the inspiring mentor to Laura, a young woman in this film TO THE RESCUE. Watch TO THE RESCUE and the other two finalists and vote by JULY 2nd. Always is sponsoring Give a Girl a Break. Three aspiring female filmmakers are vying for a Talent Grant to help them pursue a career in film. June 26-27, eight, female students at the Bahrain Polytechnic Institute displayed their third year projects. The depth and quality of their work was evident. I was so pleased to see how Bahraini women envision effectively engaging others using modern methods. Bahrain may be known for its two-seas – the salty Gulf and the ancient, sweet water; but since I have lived here, I have noticed a third current. It is an under-current of organic creativity. Today Bahrain’s “art scene”, officially sponsored since 1983, has been outflanked by Art Dubai. Eight years ago, this now, annual event was created as one more attraction to draw international tourists. The organizers have successfully secured the international acclaim they sought. Still, on this tiny island, I feel a growing wave of creativity. I sense it is the children of the first generation that went to the West to be educated. The “second” generation also studied abroad, but not as engineers or doctors. Uninterested in corporate jobs, they have chosen to follow the heart and to become musicians, photographers, designers, or artists. Recently, I chatted with Ramah al Husseini and Yasmin Sharabi, two women who have returned home, and who are helping to grow the local art scene. Yasmin Sharabi is the curator at the Waterline Gallery. Like many Bahraini landmarks, it was “previously known as” the Atrium Gallery in the Bahrain Financial Harbor. Potentially a way to draw visitors into the Financial Harbor’s echoing halls, the gallery‘s brand is undergoing a face-life as it seeks to find its place within the larger, international art scene. At the Waterline, the RE Exhibit continues. RE features four artists who recycled materials to relay their observations of human excess while providing a glimmer of hope and innovation. Last week, I met young artist and gallery operator, Ramah al Husseini who presented her portfolio to a group of art lovers. Returning to Bahrain after university in Canada, she decided to open a private gallery that houses an exhibition hall and an art studio. Located in a twenty-year old, renovated house in Budaiya, like the Waterline Gallery, Anamil 296 is a brand in-progress. 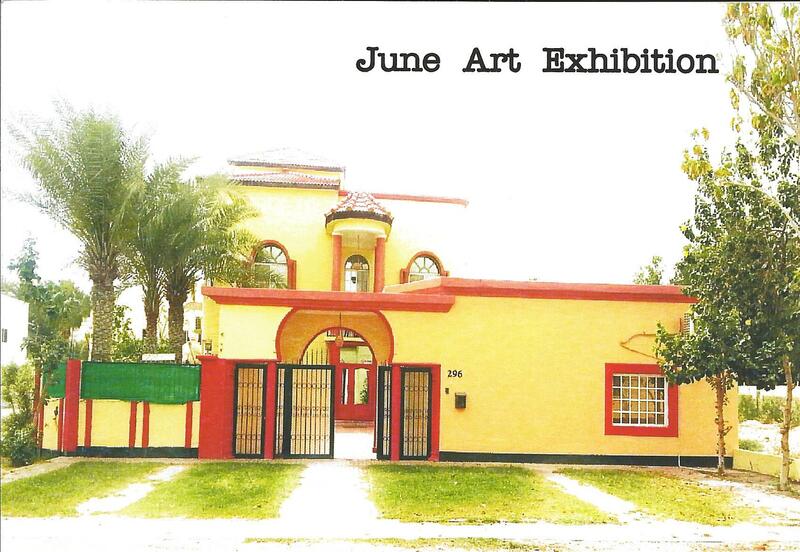 Still, Ramah announced her third exhibit would open this week. If the waves of creativity continue to wash across this island, I think the fires of despair will be extinguished. The Waterline Art Gallery, 3rd Floor Atrium, Harbour Mall, Bahrain Financial Harbour. There is a new entrance into the Financial Harbour at Bab Al Bahrain/Manama City Center. The Financial Harbour road leads straight to the building, but you will completely circle the Harbor Tower to end up back at the side facing Bab Al Bahrain where the Visitor Parking entrance is located. After taking the elevator to the third floor, follow the signs to pointing left through the dark offices to enter the gallery.